After a journey of ten months and covering 442 million miles, NASA’s Maven spacecraft entered in Mar’s orbit on this Sunday night. The spacecraft will study Red Planet’s atmosphere and data obtained from Maven will help scientists to build better understanding about how the climatic conditions changed on Mars. “Previous spacecraft have made measurements, and we’ve learned a lot about the upper-atmosphere, but we haven’t been able to put the whole end-to-end picture together,” said principal investigator Bruce Jakosky. “I’m hoping Maven will be a mission of discovery, that almost everything we observe will lead us to fundamental new insights about the Mars environment today and how it has evolved over time,” the University of Colorado, Boulder, researcher added. 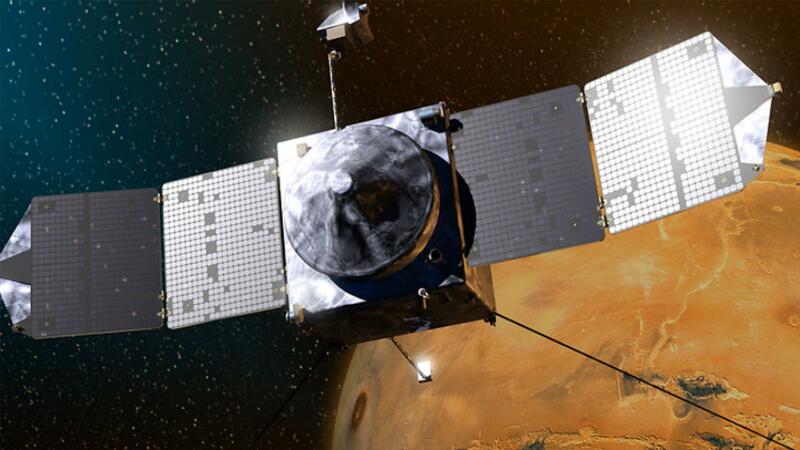 There are still six weeks left before Maven test its instrument and starts sending data. Maven spacecraft’s arrival will be followed by Mangalyaan, India’s first mission to the Mars. Mangalyaan has a different objective of observation of methane gas, which is an indicator of biological activity on the planet. Data received from both the spacecrafts will help the scientists in developing a better understanding about atmosphere of the Mars. Atmosphere of the planet Mars is mostly composed of carbon dioxide, and atmospheric pressure is 0.6% of the Earth. Maven takes around 35 hours to orbit around Mars; scientists are working on bringing down Maven’s orbital period to 4.5 hours in coming weeks. This mission costs NASA around $700 million.